Maruti first launched the Ertiga in India more than 4 years back and the MPV turned out to be an instant success since it offered excellent practicality at a price which screamed value-for-money. The Ertiga has been competing with quite a lot of rivals in the 7-seater space and it has managed to carve out a good reputation for itself. The automaker gave the MPV a mid-life update some time back and also started offering the SHVS feature (shared with the Ciaz) to make the car slightly more frugal. Entry to the cabin is made easy by large doors that open wide. The dashboard is a straight lift from the Swift, which means quality and ergonomics are good. Even the door pads and other plastics are of good quality, and the Ertiga doesn’t feel built to a price. There’s a long list of equipment too, which includes a CD player, Aux and USB ports, steering-mounted audio controls, powered mirrors and power windows. However, the more affordable VDi/VXi variants do without alloy wheels, fog lights and airbags. Visibility is decent from the front seats, which are taken from the Swift. They are broad with soft yet generous cushioning, which makes them truly comfortable even over long journeys. In the second row, the seat squab is a touch short, so under-thigh support is not as good as we would have liked. Other than that, it’s hard to fault. The high ‘hip point’, adjustable backrest, terrific headroom and decent legroom make the Ertiga’s middle bench a pretty comfortable place to be. Move to the rear and it is clearly evident that the Ertiga can’t compete with the likes of the Xylo and Innova for sheer carpet area, but that said, the last row isn’t as uncomfortable as we thought. The narrow access means getting into the last row requires some contortion, and once you’re inside, shoulder room is tight and the squab is short. The Ertiga’s best trick is the massive 240mm seat travel that allows you to deftly balance the legroom for both the second- and third-row passengers. Well-engineered latches and levers allow you to push forward or collapse the seats neatly into the floor. With all seven seats in place, there is enough space in the back to hold just two soft bags, while a concealed storage bay hidden beneath can hold small items. For more space, the third row can be folded flat. You also have the option to fold the middle row, and the 60:40 split further aids flexibility. Simply put, the cabin is far more useable than the Ertiga’s exterior dimensions would suggest. Making space is the easy part, but what is paramount in a good people mover is whether or not it has the heart to haul all those people easily. Powering the Ertiga are two engines, a K-series 1.4 litre petrol and the one we have here, the tried and tested, multifarious, Fiat-sourced 1.3-litre DDiS turbo diesel unit. It’s the same engine that powers the Maruti SX4, Fiat Linea and the Tata Manza. While powering these sedans is one thing, carrying seven passengers with a fair bit of luggage is another. But Maruti have done well to tune the engine to suit the Ertiga’s characteristics. Though engine output remains similar to the SX4 and the Manza (Linea is slightly higher) at 90PS @ 4000 rpm and a maximum torque of 200Nm @ 1750 rpm, it’s the short gear ratios that make all the difference in the Ertiga. So what’s the performance in the real world like? Well, for starters we have turbo lag, not too much of it but it definitely makes its presence felt, however, once you’re above 2500 rpm, so does the turbo boost! While acceleration is decent, the midrange is where all the action is and the Ertiga never feels breathless here. Even with seven people on board, the motor does not feel restrained as long as you keep it in the powerband which is not really a difficult task. Uphills with a full load and air-conditioning on, however, does take a toll on the small capacity engine and frequent shifting is required to keep the Ertiga moving at a fair pace. Talking about numbers, the Ertiga lighted up its front tyres (yes, this one’s a front wheel drive) and launched its way to a 100km/h in 14.09 seconds which is mighty impressive for an 1800-plus kg vehicle. But it’s never about outright acceleration when it comes to MPVs. Slotting the gear lever in 3rd, this big momma did the 40-80 km/h stint in a scant 6.02 seconds. Considering our traffic conditions barely let you get into 4th or any other higher gears, the Ertiga can just laze around in 3rd all day. Just for the record, the Ertiga also managed a true top speed of 164 km/h, which means it can cruise at 120 km/h all day without breaking into a sweat. Retardation was pretty good too. Our test vehicle came with ABS with Brake Assist & EBD and did a great job when the anchors were dropped. Standing on the brakes at 60 km/h, the Ertiga managed to show zero on the speedo in 2.63 seconds over a distance of 21.86 metres and quite steadily, too, while from a 100, it took 3.81 seconds and all of 52.10 metres to come to a halt. The Ertiga’s driving dynamics are largely influenced by its long wheelbase – the 2.74-metre gap between the front and rear axles give this MPV good poise and straight-line stability for most situations. The flipside is that it isn’t happy darting through corners and prefers a more relaxed driving style. The soft suspension means the low-speed ride is pretty absorbent, and even as speeds increase, the Ertiga handles bumps with aplomb and feels pretty solid. The Ertiga’s suspension works silently too and it’s just over sharp bumps that there is a mild thud from the suspension. There is a bit of up-and-down motion over undulating surfaces and the diesel pitches a bit more in the front. However, at moderate speeds, this never gets uncomfortable and it’s only when you begin to push really hard that you long for a tauter setup. Considering its MPV proportions, the Ertiga doesn’t roll excessively and the steering is fairly accurate too. What you do miss is a tighter turning circle and the ability to wiggle into tight parking spots as with a hatchback. However, this doesn’t take away from the fact that the Ertiga is by far the most urban-friendly MPV in the market today. This is a diesel dominated segment and Maruti officials say that they expect to sell 8 diesel variants of the Ertiga for every two petrol variants. This preference for diesel is going to persist as long as the differential exists, but this segment is just that much more sensitive to the costs and the savings. Maruti has just barely managed to launch a compact premium UV before the flood that is due to hit the roads in the next one or two years from competitors like Nissan, Hyundai, Toyota and Renault, and possibly even Mahindra & Mahindra – which is expected to launch a compact Xylo. 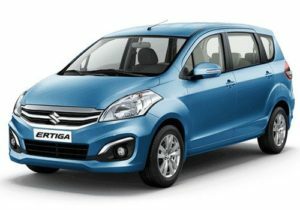 Though a bit late coming from the car market leader, the Ertiga could still benefit from Maruti’s image of being a manufacturer of reliable, efficient and low-cost cars. So, though the target is the urban buyer looking for a family mover, sales could eventually come in quickly from institutional buyers too.